Ever wondered what you have in common with Beyoncé? Why do some of us need glasses? Being able to see is something many of us take for granted but there are many different causes as to why so many of us need glasses, read our blog for more. If January has left you feeling down, take a look at Vicki’s blog this week and learn how to make the most of life. What to pack and what not to pack! How much plastic is in your period? 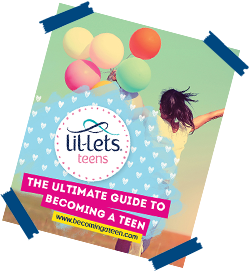 After Vicki gave you some great tips to make your sleepover party go smoothly, we at Lil-Lets are bringing you some games ideas to fill your sleepover night with extra fun. PMS – WHAT IS IT? Here at Lil-Lets Becoming a Teen we are strong supporters of the Anti-Bullying Alliance and their week long drive to raise awareness of bullying. The weather may be turning ugly, but that doesn’t mean your skin has to! Skin needs just as much love during the winter months as you lavished on it during the summer. Don’t let your period stop you from having fun in the water.